Tampa Bay Club Sport presents Club Sport Corporate Events. Club Sport has always been a proven leader in providing fun filled, year-round events. Now get your company involved & your employees motivated. We specialize in organizing events for company picnics, team building, or corporate outings. Club Sport has over 10 years of event planning experience and can run almost any kind of corporate sporting event. GET MORE INFO HERE. 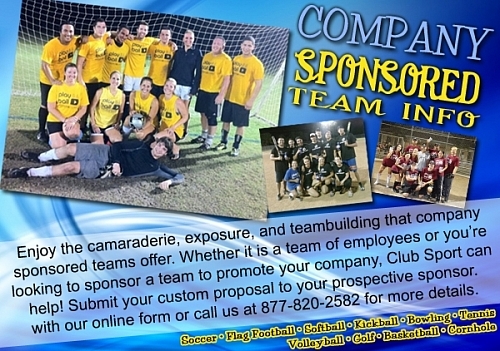 Get your company involved in Tampa Bay's best adult sports leagues. Tampa Bay Club Sport organizes and runs a huge variety of sports leagues throughout the bay area. Dozens of local companies such as Raymond James, Jabil, America II, Nielsen Media, Lincare, Bright House, and more use Club Sport leagues to let employees unwind and stay active. Sponsors the coed soccer team: IRONMAN FC. Jwags Sponsors the coed kickball team: Where My Ptiches At?